When you installed Elastic Cloud Enterprise and logged into the Cloud UI for the first time, you were greeted by two deployments. We’ve also shown you how to create your own first deployment, but that still only makes a few deployments. What if you had hundreds of deployments to look after or maybe even a thousand? How would you find the ones that need your attention? Looking for all deployments of a specific version, because you want to upgrade them? Easy. Or what about that deployments you noticed before lunch that seemed to be spending an awfully long time changing its configuration—is it done? 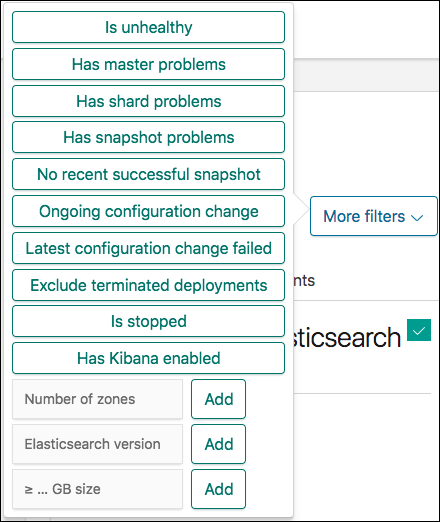 Just add a filter to find any ongoing configuration changes.